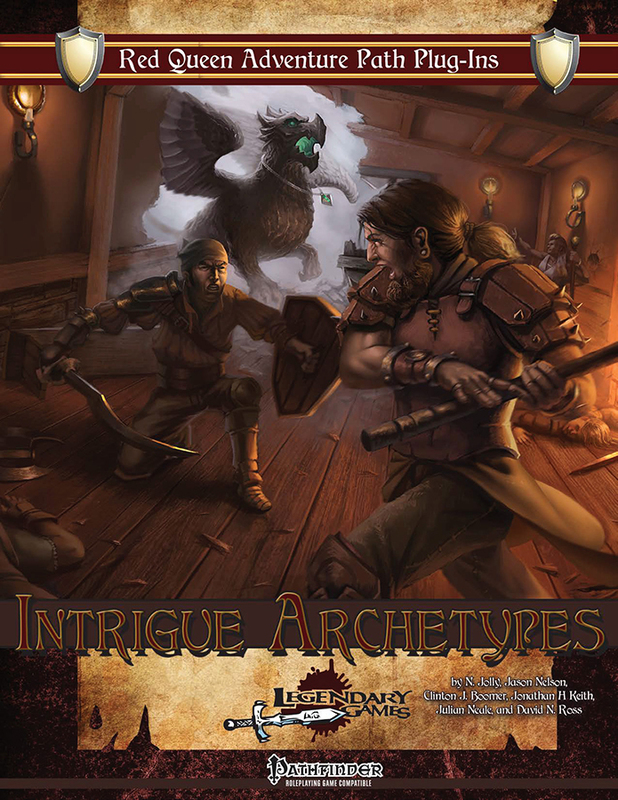 Intrigue Archetypes is the perfect addition to any Pathfinder game set against a backdrop of courtly intrigue, clever manipulation, and urban decay, crime, and corruption. This 40-page class supplement features 10 incredible new archetypes replete with panache and flair, from the scheming priest and mastermind psychic to the trickshot sniper vigilante, wild card swashbuckler, spell hacker wizard, and cityscape hierophant druid. Each has an incredible array of unique and flavorful abilities that will make urban adventuring come to life like never before. You'll also find over two dozen new intrigue and urban-focused feats and alternate class features like arcanist exploits, magus arcana, and vigilante talents, plus the metallomancy of the clever coinmage prestige class. Capping it all off, we bring you The Grey Shadow, a vengeful vigilante ready to use as an ally or adversary for your urban PCs while showing off some of the fantastic new options in this book. Your characters may delve the deepest dungeons and traverse the widest wilderness, but the siren song of the city calls, and when it's time to answer your characters will be ready! Add Intrigue Archetypes to your Pathfinder campaign today and Make Your Game Legendary!